There is no better way to help celebrate America’s 237th birthday than with fireworks, at one of the many waterfront pyrotechnics shows scheduled throughout Southern California on the Fourth of July. Boaters will have the best vantage points for viewing these aerial displays. However, those preparing to head out for the festivities are advised to plan accordingly, as the number of boaters on the water will increase dramatically on July 4. Along with advising boaters to get to local harbors bright and early before the crowds start to gather, Southern California harbor patrols have also issued advisories covering areas that boaters must stay clear of during fireworks displays. Boaters should be aware of these exclusion zones before they hit the water. 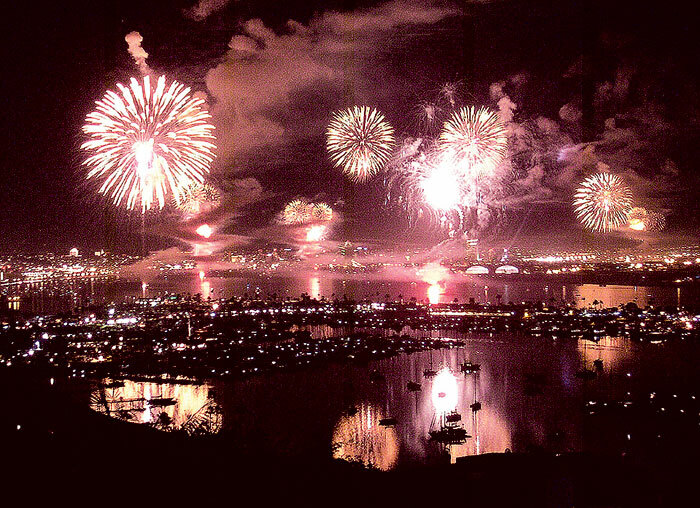 In addition to fireworks, boaters will find boat parades, barbecues, car shows and a variety of other activities to enjoy at harbors from San Diego to Santa Barbara. To help you plan your holiday cruise, here is The Log Newspaper’s annual list of Independence Day fireworks shows and related activities that Southern California boaters can enjoy. Fun Events: The five fireworks locations will feature pyrotechnic launches in unison, timed in conjunction with music broadcast on 105.7 The Walrus FM radio station. When: 5-9:45 p.m. July 4 Best Views: Aboard the 1898 steam ferry Berkeley, the tall ship Californian or the museum’s 1914 pilot boat. Fun Events: An Independence Day barbecue dinner — $35-$40 for adults, $17-$20 for children — will be held on the observation deck of the museum’s historic steam ferry Berkeley (first seating 5-6:30 p.m., second seating 7-8:30 p.m.), where there will be spectacular views of the Big Bay Boom fireworks display. The museum is also offering fireworks cruises aboard the tall ship Californian ($85 for adults, $50 for children), and aboard the museum’s 1914 pilot boat ($30 per person). Passengers on Californian will experience the booming sound of the ship’s 6-pound deck guns as they are fired to signal the start of the fireworks show. Fun Events: A day packed with festivities starts with the 38th annual 15K Run/Walk at Tidelands Park at 7 a.m. Other events include a rough-water swim at Central Beach (check-in at 7:30 a.m.), Art in the Park (8 a.m.-4 p.m.), the 65th annual Independence Day Parade along Orange Avenue (9 a.m.), a Coronado Community Concert Band performance at Spreckels Park (4 p.m.) and fireworks viewing at 9 p.m.
Info: Using the orchestral music of SeaWorld San Diego’s newest show, “Blue Horizon,” the “Into the Blue” Fireworks Show provides a spectacular ending to Independence Day celebrations. Contact: oceansideyc.org or call Debbie Trusty at (760) 721-7480, or Evelyn at (760) 722-5751. Fun Events: Dana Wharf Sportfishing is offering a fireworks barbecue buffet dinner cruise from 7:30-9:30 p.m. ($79 for adults, $39 for kids ages 5-12, free for children ages 4 and younger) and a fireworks-only cruise from 8-9:30 p.m. ($29 for adults, $19 for kids 3-12, free for children 2 and younger). Fun Events: Daytime activities include a chili cookoff, a dunk tank, a bungee run, an All-American Food-Eating Contest, carnival games, limbo contests, inflatable jumpers and bounce houses. Tribute bands are scheduled to take the stage throughout the day. The rock group America will perform starting at 7:30 p.m., followed by a fireworks spectacular capping off the event at 9 p.m. VIP Package is $200, Access Ticket for four with parking is $80, walk-in admission is $20. Boating Info: All boaters are invited to decorate their vessels to the theme of “Stars and Stripes Forever Is the Color of Our Freedom” and participate in American Legion Yacht Club’s yacht parade. Fun Events: Pancake breakfast 7-11 a.m. ($10); barbecue lunch and dinner noon-5 p.m. ($10), and live music and dancing 1-5 p.m.
Fun Events: Rock’n ‘80s at the Dunes will include Food Truck Wars from noon-4:30 p.m., a carnival with a ferris wheel and zip line, Aquatic Park activities, inflatable jumpers and bounce houses — along with a full day of 1980s music. DJ Richard Blade will appear starting at 4 p.m., along with a variety of live bands scheduled to take the stage. Access Ticket for four with parking is $30, walk-in admission is $10. Fun Events: The annual golf cart parade down Crescent Avenue will be lead by the University of Southern California Matching Band this year. A barbecue and buffet dinner, along with music, can be enjoyed by guests at the Casino Ballroom’s balcony, overlooking the fireworks display ($40 for adults, $20 for children ages 3-11). The 2013 Catalina Island Museum Fourth of July Music Festival takes place at The Point, immediately adjacent to the Avalon Casino, at 2 p.m. Fireworks will begin at 9 p.m. over Avalon Harbor. Fun Events: A fireworks spectacular is set to blast off over Isthmus Harbor, beginning at dark July 5. The next day, boaters are invited to decorate their dinghies in the most patriotic way possible, and participate in a parade through Catalina’s West End coves, from 2-3 p.m. Prizes will be awarded to the most creatively decorated dinghies. The 27th annual Children’s Festival will be held from 10 a.m.-noon and will feature crafts and activities. Fun Events: The four-day event will feature food vendors, live entertainment and family activities every day from 10 a.m.-9 p.m. The Fourth of July events include the Surf City 5K Run and Fitness Expo (7 a.m.-noon), the 109th annual Fourth of July Parade (10 a.m.-noon) and the grand finale fireworks display shot off the end of the pier, beginning at 9 p.m.
What: Live music, featuring classic rock and the latest hits, a barbecue and a beer garden, boat rides and great views of the Queen Mary fireworks show can be enjoyed at the Belmont Veterans Memorial Party on the Pier event ($20 for adults, $10 for kids age 12 and younger). Fun Events: Hosted by Alamitos Bay Yacht Club, the event will feature a barbecue, fundraising opportunities for the Long Beach Firefighters Memorial Association and a fireworks display over Alamitos Bay. Tickets are $30 for adults, $10 for children 10 and younger. When: Noon-11 p.m. July 4, fireworks begin at 9 p.m.
Fun events: Onboard activities include 1920s-1940s-style celebrations from noon-4 p.m., 1940s-1960s-style celebrations from 4-6 p.m., 1960s-1990s-style celebrations from 6-9 p.m. and 1990s-2010s-style celebrations from 9:30-11 p.m. Numerous activities, live musical acts and dancing are scheduled. Fireworks begin at 9 p.m. General admission tickets are $39.99 for adults, $19.99 for children ages 12 and younger. Adult VIP admission, which includes an outdoor showing of the movie “Independence Day, are $59.99; $39.99 for children. Event parking is $20. Overnight packages are available. When: 5-10 p.m. June 28; fireworks at 9:20 p.m.
Fun Events: More than 100 classic cars on display, live music, dancing water shows at the Gateway Plaza Fanfare Fountain, gourmet food trucks and a beer garden, and fireworks at 9:20 p.m. When: 9 p.m. Best Views: Waterfront sides of most hotels, restaurants, beaches, apartments and anchorages throughout the marina. Fisherman’s Village, Burton Chace Park and Marina Beach are popular spots to watch the 20-minute fireworks show. Fun Events: The seventh annual event includes food and beverages, the Fun Services 56-foot Obstacle Course, the Kids’ Freedom Parade, swimming in the lagoon, arts and crafts, live music and a DJ, the Free to Be Me South Bay Drum Circle, Yankee Doodle Poetry with David Prather, a Beach Sports Piano Run in the lagoon, paddleboard lessons and racing. Fireworks will be launched 300 feet off the lagoon starting at 9 p.m., timed to patriotic music. Food options will include barbecue chicken and tri-tip plates, sandwiches, salads, burgers, hot dogs, funnel cake, Italian ices and a wide selection from the Ruby’s Diner service window on the lagoon. Many ticket and seating options are available online. When: Activities from 8 a.m.-9 p.m. July 4; fireworks at 9 p.m.
Fun Events: Daytime activities at Marine Emporium Landing start at 11 a.m. and include a farmer’s market, an old-fashioned family barbecue, live music, a petting zoo, an inflatable fun zone, a rock climbing wall and food booths. A 10K Race and 5K Fun Run/Walk begin at 8 a.m. along Sunset Lane, Hollywood Beach (registration is at 7 a.m.). The sixth annual Children’s Parade starts at 10:30 a.m., proceeding from Albacore Way up Harbor Boulevard to Cabezon Circle. Fireworks will begin at 9 p.m.
Where: This year’s parade theme is “America the Beautiful.” The parade begins at Micheltorena Street and proceeds down State Street to Old Town Santa Barbara, concluding at Cota Street. Fun Events: The city of Santa Barbara and Santa Barbara Sparkle will co-host a fireworks display lasting 18 to 20 minutes. Music for the celebration will be simulcast on radio. A variety of other Independence Day celebrations are planned citywide. Where was the Long Beach fireworks photo taken from? They climbed up somewhere!